Versele Laga Oropharma Canto-Vit Liquid is a liquid mixture of vitamins and amino acids enriched with vitamin E. This product is especially indicated for singing and fertility. Vitamin E is a biological antioxidant: it protects the bird's cell structure and has also long been known for promoting fertility and getting the bird into optimum breeding condition. Canto-Vit, with its unique composition, ensures a lovely singing quality of canaries and finches, and increases fertility. 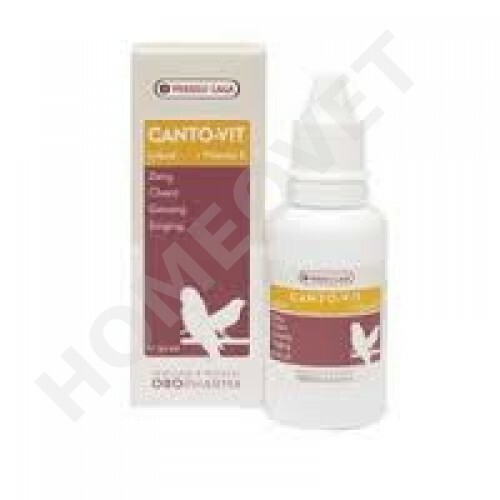 15 drops of Canto-Vit Liquid in 50 ml clean drinking water. Prepare fresh every time. During the (song) contest season for finches and other song birds: give three times a week.